I’ll tell you up front that this blog has nothing to do with running. Or at least, not much. The beauty of having a blog called “The Penguin Chronicles” – seeing as how I’m the Penguin – is that it doesn’t have to do anything except chronicle. So that’s that. I don’t remember a time in my life when I wasn’t interested in, and in fact crazy about, motorcycles. The neighbor across the street had a shiny red BSA when I was growing up. He had the leather jacket and everything thing. He was COOL. When he eventually got a Harley-Davidson Sportster I was in awe. My uncle showed up with a Sears moped when I was about 12 years-old. My cousin and I rode it nearly non stop for days. Then, just as suddenly, it disappeared. I think someone must have worried that we’d get hurt. A friend had an old Cushman motor scooter. Not one of the cool Cushman Eagles that are still VERY collectible. Nope. This was the base model with a tw0-speed manual transmission with the shifter on the left side of the gas tank. Whenever he let me I’d ride that scooter for hours. No one in my circle of friends was cooler than me. My senior year in high school I nearly had my parents talked in to my getting a new Triumph Bonneville until a crashed a different friend’s Honda 65. I bought my first motorcycle, a very used Honda CL77 [305 Scrambler] with my first tax refund. It was the best $300 I ever spent. I won’t bore you with the litany of motorcycles that I’ve owned – well over 60 – but I can tell you that I remember every one of them. I worked for 10 years in a motorcycle dealership and I can remember nearly every motorcycle I ever even sat on. My son started riding in front of me, sitting on the edge of the seat and gas tank, and hanging on to the handlebars when he was not much older than 2. He went to his first day of school in a BMW sidecar. He got HIS first motorcycle, and Honda Z50, when he was 7. He’s now 40 and that very Z50 is being restored by his step dad. And I’ve got a pretty good idea whose going to be riding it. The first photo is of my 6 year-old grandson, Hunter, on HIS first ride. 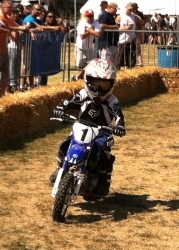 Yamaha was offering a “Learn-to-Ride” experience for kids from 2-12 at the MotoGP races at Indianapolis. His “Opa”, Pat, another old-school motorcycle enthusiast and I just looked at each other and KNEW it HAD to be. Hunter HAD to learn to ride THAT day. And ride he did. He bounced off the hay bales once, popped up, and never looked back. There are hundreds of recreational lifestyles, from fishing and hunting to boating, camping, and more. If we’re lucky we enjoy one of these lifestyles ourselves. If we’re REALLY lucky,we get to pass that interest on from generation to generation. I now have two recreational passions in my life. Running and motorcycles. The second photo is Hunter running. I am committed to exposes my grandchildren to both of my passions. It’s the only way that I can think of to help them experience the joy that I have. My first bike was a 49cc Sears moped that we treated as a dirt bike. Now Shadow 1100. 2 of the boys ride. Motorcycles are not on my list. But I have a grandson too, and although he is only two and a half, it’s a pretty cool thought that I might inspire him to run one day. 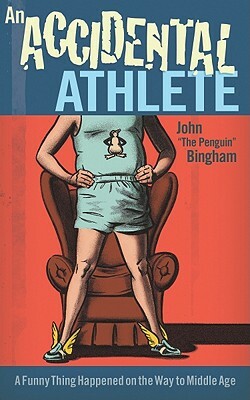 You, John Bingham, helped inspire me to begin running in my middle age. Now I love it. 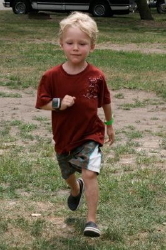 Thanks for suggesting that maybe running could be something to share with my grandson. If we only ever did one tiny race together, it would be the race of a lifetime. Thanks!